So what is saving my daughter's clothes and saving me time from changing her outfits 3+ times a day? An awesome bib called bibbitec. It is hailed as the ultimate bib that can be easily worn over the entire body protecting clothes from whatever clutter you may encounter. Susie Taylor, the creator, has two messy boys that were giving her a run for her money on a plane with spills and stains so she set out to change the baby bib world. bibbitec is stain-resistant, fast-drying, soft, and made of lightweight material that has the strength of a Superhero, the adaptability of a Supermom. The cover up is made from certified non-toxic material. A patented, multi-tasking Ultimate Bib that serves as the catch all in your diaper bag and at home, delivering cleanliness and ease in a single bound. bibbitec's cozy, stain-resistant, fast-drying, soft, lightweight material has the strength of a superhero, the adaptability of a Supermom. The Ultimate Bib is perfect as a soft, non-toxic burp cloth – changing pad – breast-feeding shield – full body bib – placemat – breathable stroller blanket – art smock – “lapkin” and apron. bibbitec is one product that will last for five years. The specifically engineered material does not shrink or lose its quality because the goods are in the thread! The high-tech material combined with the simple yet, dare we say, ingenious design give Moms the respect we deserve. There are two different sizes that I received of the Ultimate Bib: the regular Ultimate Bib for my 3 year old and the Ultimate Bib Baby for my 1 year old. 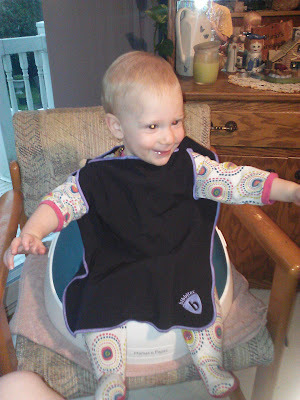 The Ultimate Bib is for AGE: 9 MONTHS TO 3 YEARS OLD. The Ultimate Bib is the only bib your child will ever need and the first, the last- the only bib you will ever need. 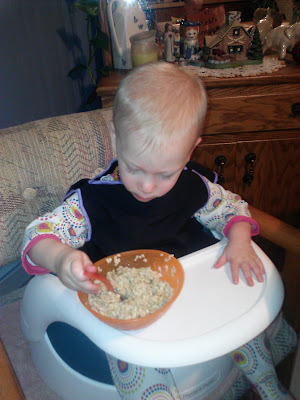 Instead of 5 bibs a day, use one bib all week that lasts all year! Keep adorable outfits safe with the bib that covers the whole baby while eating, no more dirty, soiled clothes! While eating, no more dirty, soiled clothes! My son loves his bibbitec Ultimate Bib and I love that it covers his cute outfits and most of his body so I don't have to clean him up after messy meals! It is a very generous size and fits him really comfortably! The Ultimate Bib Baby is for AGE: NEWBORN TO 9 MONTHS OLD and is just a little smaller in size for younger children! I love that it has no snaps, velcro or ties, easily slips over the head and through the armholes because I usually only have one hand or need to do things quickly! I don't have time to struggle with tying or buttoning! Best of all, it has great coverage for my daughter's outfits and most of her body so I don't have to give her a full bath after every meal! Plus, a quick wipe passed over messes, and you get a clean and instantly dry bib, ready for the next use. Baby food, formula... everything just wipes off in an instant. I love that I now don't dread meal messes anymore with the bibbitec Ultimate Bibs! Buy It: You can purchase the Ultimate Bib for $24.99 and the Ultimate Bib Baby for $19.99 from the bibbitec website. And make sure to use the discount code "Stew" to receive 10% off your bibbitec purchases!